Koh Phi Phi Islands Tourist Information – Almost everyone refers to Phi Phi as a single island; however we are actually talking about an archipelago of 7 islands that lies between Phuket Island and Krabi at the lower part of Pang Nga Bay. The biggest of them is Phi Phi Don Island. The only village of the archipelago is built here and over the years developed from a small fishing village to a small town with large offers of accommodation, some shopping, restaurants & pubs. How to Get to Phi Phi Island? The most common way to reach Phi Phi is by boat. Ferries such as the Phi Phi Cruiser connect daily and regularly Phi Phi Don with Phuket, Krabi and Koh Lanta. The journey to cover the 50 KM between Phuket and Phi Phi takes about 2 hours. Krabi is a bit closer, 40 Km between Ao Nang and Phi Phi, so it is faster to travel between the two places. Koh Lanta is just one hour and 30 minutes south. Speed boats services are also operating to and from Phi Phi’s Tonsai Bay where the pier is located. If you are a group or would like to make your holiday special you can charter a speed boat and reach your hotel in Phi Phi at your convenience with no limitation due to schedules. Recently a new service began an operation and now it is possible to arrive in Phi Phi by air . This service is available from Phuket or Krabi airport and from any other location in South Thailand. To move around Phi Phi Tonsai Village the main vehicle is yourself. There are no cars or other four wheeled vehicles here. There are a few side car motorbikes on the island and are used to transfer materials and luggage. This is one thing that makes Phi Phi so special. Going for dinner or diving, it’s just a short walk to your favourite restaurant or dive centre. As Phi Phi is part of an archipelago and as the most important activities are related to water, often you will use a boat to move around. Out on Tonsai pier you will see a long line of traditional “longtail boats” These boats have flat hulls and a long shaft connecting the engine to the propeller that allows them to drive in very shallow water. It’s a great way to go snorkelling with reef sharks and sightseeing at Long Beach at sunset. No doubt this is a year round place to visit. You will found Tonsai village packed during the high season and crowded the rest of time. There is a lot to do from early morning to very late at night, with a very relaxed life style. Rain isn’t a really an issue here, lanes are narrow and easy to walk around without getting too wet, there’s no traffic, and no rush to go from one place to another. During the summer, from May to October the sky has clouds but the rain is never too strong here. The island doesn’t have high hills that attract clouds, you can always find a good place sheltered from the wind and the sea is always clear and blue offering year round great diving and snorkelling. The climate is the same as Phuket with rains concentrated more between middle of September to the middle of November. From December to April there is no rain and the sea is completely flat from January to May. The best time to come is in July, because there are less tourists, the sea conditions are never too rough, often it doesn’t rain all month and the rates are low because it is considered off season. Clear sea water dominates the scenario so water sports and activities are the best things to do around the Phi Phi islands. You can also climb the beautiful cliffs, getting up on the green top of the islands is a unique experience. Phi Phi Scuba Diving and snorkelling are the easiest and most popular activities, we at Easy Day Thailand consider staying on Phi Phi the best way to enjoy diving around the Phi Phi Island and King Cruiser area, no road transfers, no long trips on the boat and back early enough to enjoy the beautiful place and your hotel facilities. 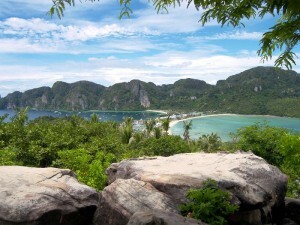 If visiting Phi Phi for Scuba Diving than check out our Scuba Diving Packages. 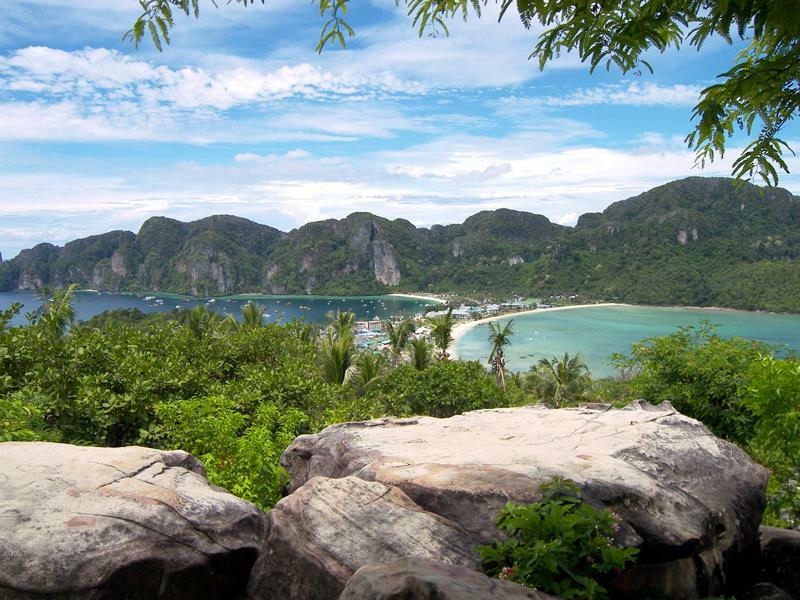 Phi Phi is an incredible location for Rock Climbing, with fantastic routes from beginner to advanced. Some of the rock formations are so beautiful at first many people don’t believe they are natural. If you into climbing than give it a try. Sightseeing is another activity, you can charter a boat and hop with your friends and family from one island to another, from Moskito to Pileh lagoon, cruising to the Viking Cave and enjoying the sunset in Maya Bay. Also popular is going to long beach and snorkelling of shark point or walking up to the PP viewpoint are cheap and easy things to do. Be warned that the steps to view point are steep and do take 15-25 minutes to climb. However there are also a large number of good massage shops offering a quality clean service, so you can relax after the View Point climb. Dining out and night life are special here, not too formal, where you can enjoy the local flavours and sea food at beach front restaurants, then have a drink at the pub with a fireball show and dance the rest of the night till early morning in the crazy open air discos. Accommodations on offer range from basic bungalows with only ceiling fans and cold water to five star resorts with all the comforts. 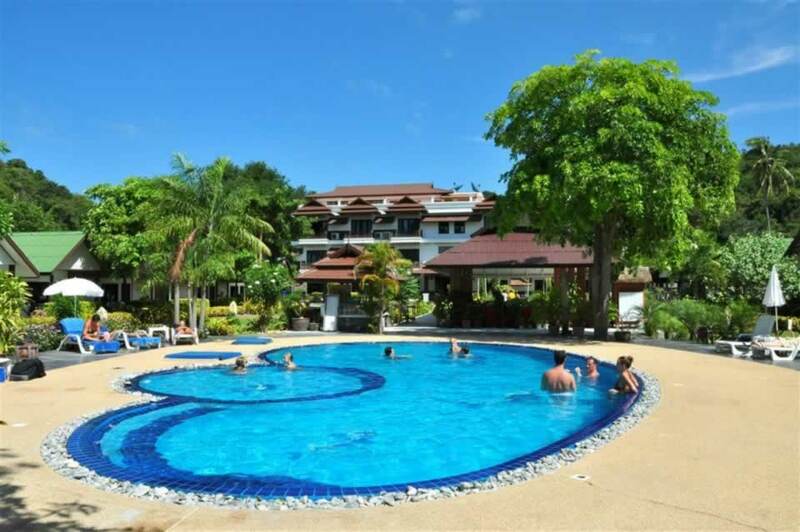 Easy Day Thailand has selected a group of Phi Phi Hotels that can satisfy all of your needs for a great longer stay holiday on Phi Phi Islands or just a short visit for a couple of nights. Not too fancy and not too basic. When staying on Phi Phi, it is best it to enjoy the many possible activities and dining out so that the hotel becomes just a place to rest and sleep. Many of the hotels face the sea and they are on the beaches, none of them are far from the crystal clear waters of the Andaman Sea. There are many beaches and the bigger islands have more than one. The most famous beach is surely at Maya Bay where the movie “The Beach” was filmed, many people visit this beautiful bay every day. If you hire a boat in Tonsay Bay around 3 pm, you can be in Maya Bay when the the bulk of the visitors have left. 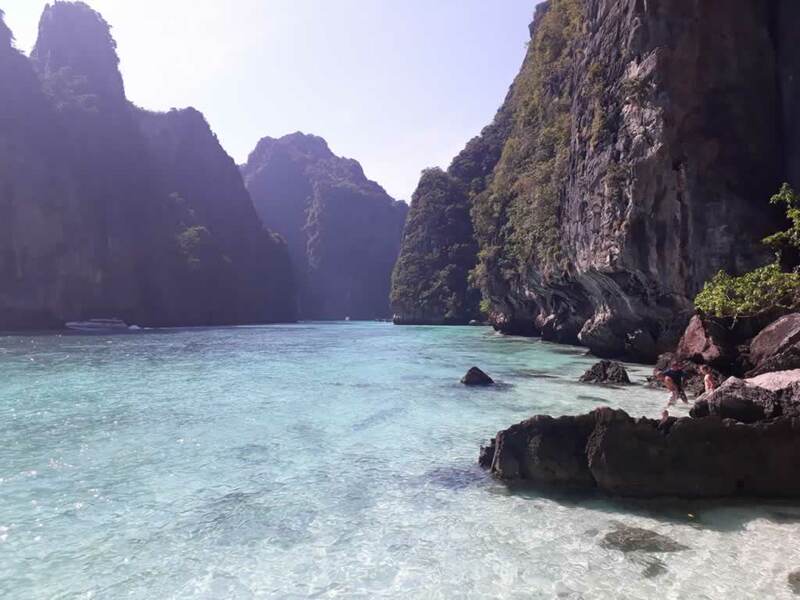 During low tide there is a small passage that connects the two sides of Phi Phi Leh and you can pass from Maya Bay to Loh Sama Bay, when one of them is exposed to the wind the other is sheltered, so there is always a quiet place to enjoy on Phi Phi Leh. Loh Sama Bay has a small beach. Another place you will want to see and enjoy is Pileh Bay, a lagoon that can be considered Phi Phi Island’s swimming pool, with water depth between 1.5 meter and bit more than 2 meters depending on the tides. Phi Phi Don has two main beaches. Tonsai which has the main pier and all the boats are parked off this beach so we suggest you sun bathe and swim at Loh Dalam beach which faces north, similar to Pileh this bay is wider and is best for swimming during high tides. The water isn’t deep so there is not much boat traffic on this side making the place the perfect beach. The two other beaches on this side are Monkey beach, during early morning and late afternoon the once domesticated, but now wild, monkeys come down from forest hills for food. The island monkey population started with animals used to collect the coconuts, then tourism made this activity unnecessary and the monkeys were released into the jungle and now they are one of most popular tourist attractions. Long Beach is located on right side entering Tonsai Bay. Here at sun set is possible to snorkel with small reef sharks that come close to the beach hunting small fish. Recently many hotels have opened operations on this beach but staying here means you must use boat transfers to get to Tonsai village. Moskito and Bamboo Islands each have one very small beach, while Bida Nok and Bida Nai are perfect for snorkelling and diving but don’t have any sand. Our friends on the island can recommend eating at the Grand Bleu for civilised dinning at a very reasonable price, Cosmic/Mamamito Restaurants for good cheap pasta and pizza, Tonsai Sea Food for seafront dining (not too expensive for what you get) and Matts Joint for an all you can eat BBQ. The Sports Bar does good food with 5 different sports screens, Breakers Bar and Grill offers a college style bar with the widest range of beers on tap and a good selection of food. As usual we like to close out our tourist information section with our personal opinion about what is good and what is not so good. Cons – First of all the Phi Phi Islands are very popular among young tourists and some people can be annoyed by the loud music from the discos during the night, one suggestion is to carry ear plugs. It is important to understand that Phi Phi Don is a very tiny island in middle of the sea and fresh water is a real problem; so when visiting Phi Phi, save water as much as you can and don’t expect good quality water from the tap and the shower will always be a bit salty. You need to plan your transfers well because is necessary to transit from Phuket or Krabi to get there, make sure you have the right information about ferries and transfers or make it easier and book a package airport to airport. Pros – The destination is excellent all year round and the life style is relaxed, the diving is great and you have a wide choice of activities. You have a wide availability of accommodation, suitable for all budgets and great variety of restaurants. The night life is a very special blending of Asian style with western taste. It very easy to get there and if you need something special, you can be in Phuket in one day for shopping and back to the island the same day if you like. Interested? Let us know… ! 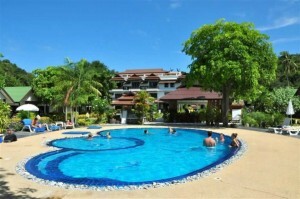 EasyDayThailand can book and organize your stay at our recommended hotels and resorts, activities and more. Just click here to send us an email or use our 1-2-go contact form. Tonsai Village was built on a small part of the island where the central flat land was a coconut grove. The growing popularity of this tropical paradise led thousands of people here and the original village and coconut grove changed into resorts, guest houses, hotels and all the facilities that are present in a normal tourist destination. The other island is Phi Phi Leh, which offers breathtaking cliffs and white sand beaches; the most popular is the beach at Maya Bay which was the superstar of the film “The Beach” with Leonardo Di Caprio. Since the film’s release, Phi Phi Islands popularity increased so much that every tourist around the region wants to visit. Two small islands south are popular among divers, Koh Bida Nai and Koh Bida Nok are world famous for their coral reefs and underwater life. On the north part the two most visited sites are Mosquito and Bamboo where snorkelers have dedicated areas to see colourful fish and corals just a few meters below surface. 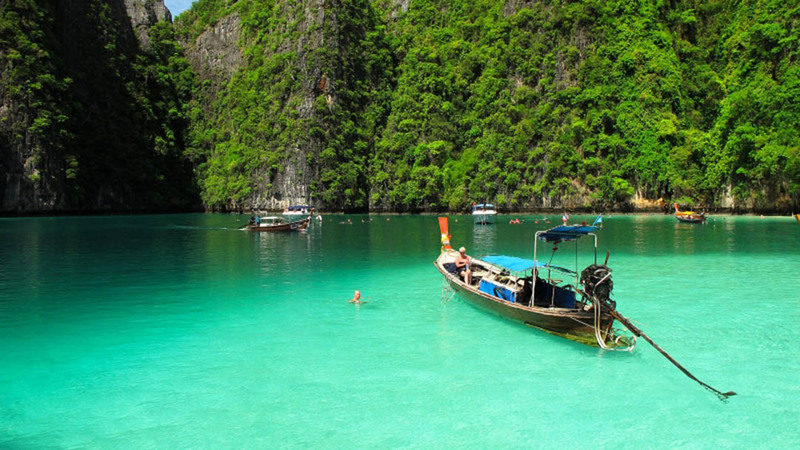 The Phi Phi Islands belong to Krabi province and are very close to Phuket Island. Despite the fast growth, the islands keep a real holiday feeling, no cars or traffic as there are no real roads, on Phi Phi Don everything is within walking distance. Surely there is something for everyone and especially for those who like water sports. Contact Us Now for Ferry Tickets, Island Hopping Tours, Hotels ….